The purpose of the flapping mechanism is to convert the rotary motion of your motor into the reciprocating motion of flapping wings. There are many ways to do this, and I will describe only some of the more common ones here. The mechanism must be lightweight and fairly simple. Yet it must also provide a fairly symmetrical wing motion so the ornithopter flies straight. The basis for most mechanisms is called a "four-bar linkage". There is a rotating crank shaft, driven by the motor. As the crank goes around, the connecting rods push the wings up and down. Staggered Crank: The simplest solution is to use a staggered crank. Here, the connecting rods go off at different angles, but their timing is corrected by having them placed on separate crank throws. The staggered crank is most easily constructed from bent wire. This limits its use to fairly small ornithopters. Outboard Wing Hinge: If your fabrication methods will not allow a staggered crank, it might be preferrable to separate the two wing hinge lines so that the connecting rods pass together between the wing hinges. Since the angle between the connecting rods is small, the flapping is fairly symmetric. You will need a more complicated body structure to support the outboard wing hinges. Dual Cranks: Another solution is to use two separate cranks. This requires an additional drive shaft and gear. This mechanism will probably weigh a little more than the outboard wing hinge mechanism shown above, but the flapping will be more symmetrical. Transverse Shaft: A variation on the dual crank idea is to use a single, transverse drive shaft, with cranks at either end. 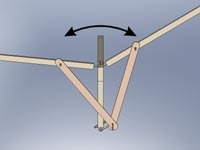 Since the cranks are not operating in the same plane as the flapping arc, the connecting rods must have ball joints at their ends. This results in more friction compared with ball bearings operating in a single plane. These are some of the most commonly used mechanisms for two-winged (monoplane), ornithopters. A wide variety of different mechanisms have been developed for special purposes, such as flapping multiple wings, moving the tail along with the flapping motion, or actively twisting the wing structure as it goes through the flapping cycle. Check out the free FlapDesign Software on this web site. It's an indispensible tool that allows you to figure out the correct dimensions for your flapping mechanism before you start to build.